At this very moment, I’m on the half of the Earth I usually don’t get to visit: the lower half. Specifically, I’m in Temuco, Chile, where I’m taking part in a drive with three Mini Countryman Hybrids which are attempting to drive the entire Pan-American Highway, from Texas all the way to the Earth’s appendix—Tierra del Fuego. But what I want to talk to you about tonight are different Minis—specifically, old ones, and even more specifically, a very particular type of classic Mini that was only made in Chile. I better explain. Just yesterday, I learned about a type of Mini I was unfamiliar with from one of BMW/Mini’s representatives on the trip. This was a Mini made in Chile from around 1968 or 1969 to 1974. And, unlike any other factory Mini made anywhere, it had a body made of fiberglass. The BMW/Mini rep said they’d looked around for one, but weren’t able to locate one. Somehow, though, I actually managed to find two of these cars in a neighborhood about a mile from my hotel here, as I was wandering around hunting for interesting cars. Hunting was good. With some technical help from Peel, who had a lot of experience making fiberglass car bodies (like the famous Peel Trident), British Leyland developed molds for a fiberglass Mini body that fit on standard Mini subframes (I think), and sent those to Chile for production, along with a similar body molding system for the larger MG 1100. The fiberglass molds were set up in the Arica, Chile factory, and thousands of plastic-bodied Minis were made between 1969 and 1974. Though they’re not the rarest Minis built in terms of sheer numbers, they are some of the strangest and most unusual Minis, absolutely unique in all of Mini-dom. They were the product of a very specific time and place and politics, and simply would not exist anywhere else, at any other time. They’ve mostly disappeared from Chilean streets now, which is why it’s so incredible I happened to find a couple. I spotted a trailer made from the rear half of a Mini from across a neighborhood street, and walked over to peer through the iron fence to look. The little yard also held an early ‘70s two-door Oldsmobile Omega, and two complete Minis, one red, and one yellow, and quite filthy. 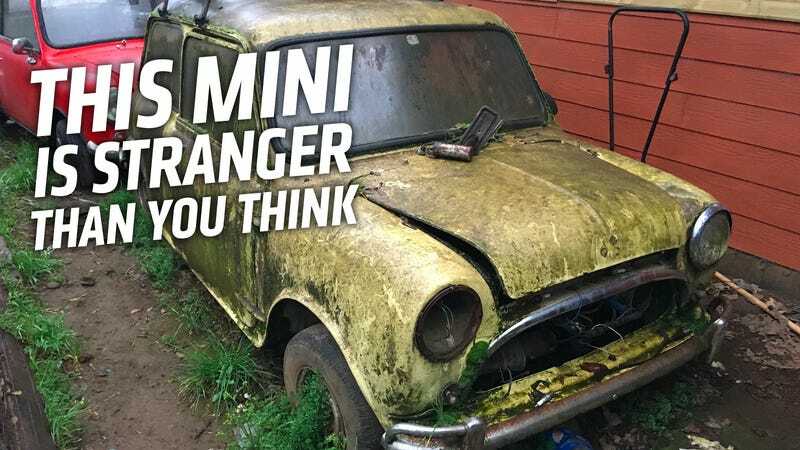 I put my face between the fence’s iron bars to look at this yellow Mini closer; it was filthy, and there was moss growing on it, but, significantly, despite all the clear evidence of years in damp conditions, there was no rust. I also noticed there was no seam where the roof would meet the body, as in most Minis, and, holy crap, there were no seams at all. I realized that I was probably looking at a fiberglass-bodied Mini, and grew thrilled in a way that would have required a lot of awkward explaining to, well, pretty much anyone. Well, maybe anyone except the person I then met. As I was greedily taking some photos, I was met by a person exiting the house. My excitement overcoming my awkwardness at being caught leering at a car in his yard, I asked if he spoke English; luckily, he did speak some, which is how I met Ricardo Vallejos, the son of Raúl Vallejos, the Wizard of Chilean Minis. Ricardo was incredibly kind to a weird foreigner poking around his yard; he invited me in, and led me into his dad’s garage area, where he repairs and restores classic Minis. In addition to the two Minis outside the work area, there was also a customer’s steel-bodied Mini in mid-restoration—Raúl was rebuilding the little inline-four engine when I saw him—and another fiberglass-bodied Mini, this one in blue. Ricardo let me examine the blue one, open the doors and trunk, poke all around, and basically just confirm, with direct tactile sensations, that yes, this Mini was indeed fiberglass. He also explained to me that, counter to what you’d think, the fiberglass Minis were actually heavier than their steel brothers, and some even think they were stiffer as well. You can also tell these Chilean Minis by their unique taillights (they have that little body-colored “cuff” that no other Minis had), along with their lack of seams and larger body panel gaps. Raúl had been working with Minis for decades and decades, his son told me. I wasn’t quite clear if he had worked for British Leyland at the factory in Arica, but I think that may be possible; the man certainly knows Minis like someone who built them. I’m astounded by so many things from the events of tonight: that fiberglass-bodied Minis exist at all, that I actually managed to find two of them by total chance, and that those Minis were owned by such charming and kind people, willing to let a goofy, overly-excited stranger into their home and talk about the cars they love with that random American dork. If there’s something to take away from this, I think it’s that wandering in places you don’t know can be a wonderful thing. We tend to focus on the dangers of walking around in unfamiliar places, and while that’s absolutely a concern, I believe that there’s far more good and interesting people out there, and maybe those people are worth meeting. Especially if there’s fascinating and weird cars involved. That’s always worth it.